Although it’s set in the present, the characters in Lasse Hallström’s Salmon Fishing in the Yemen seem to have been imported from a different time. The good ones behave in a courtly manner and speak in dignified tones and the rascals twinkle and flounce. 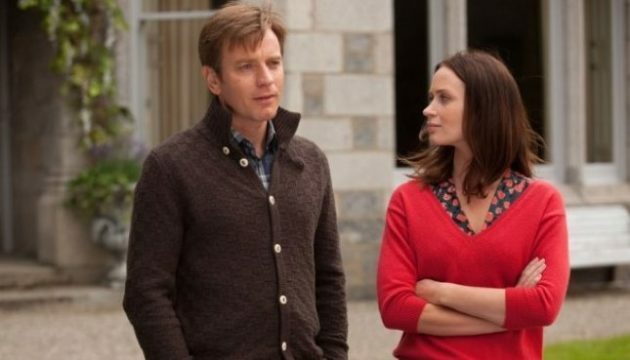 Often the effect of Simon Beaufoy’s script (adapted from Paul Torday’s 2007 novel) is refreshing, due in no small part to the congenital irresistibility of the actors speaking his lines -- Ewan McGregor, Emily Blunt and Kristin Scott Thomas. It’s when the adorably priggish Cary Grant type is accused of having Asperger’s by his plucky but labile future love interest and the benevolent Sheik bankrolling the duo’s wacky experiment is nearly assassinated by Yemeni jihadists that things get to feel a little pear-shaped. Things open on a sprightly note: Harriet (Blunt), the attaché to a wealthy Arab Sheik (Amr Waked), taps off an email to Dr. Alfred Jones (McGregor), a fisheries scientist with a government job, about the Sheik’s desire to fill the Yemen River with North Atlantic salmon. Whatever the Sheik wants the Sheik gets, although his reasons are never really clear -- or convincing, anyway. Although all the salmon fishing any man could want is available at his English estate, we are supposed to believe the Sheik has a vision of bringing two worlds together. This is all British diplomatic relations guru Patricia Maxwell (Scott Thomas) needs to hear. After a decade of war in the Middle East, the Sheik’s plan looks like a human interest oasis in a PR desert. Fred’s not having it, of course. Fred’s not having much of anything, including his awful wife (Rachel Stirling). Although McGregor is novel as the endearing but highly repressed nerd, his scenes with Stirling -- who treats Fred like a pet who has outlived his welcome -- are the only ones in which he feels a little miscast. Middle aged and stagnant is not a look McGregor can pull off quite yet; even his most consternated furrow feels a beat away from that wolfy grin. He’s more natural with a fellow ingénue like Blunt, and their scenes together are charming enough to give the story and its sleepy, slightly TV movie-ish pacing that something extra. Fifty million pounds and a weekend seduction at his sprawling estate convince Fred to help the Sheik with his idea, and the rest of the film involves the trio working together to stock a desert river with salmon and see if they’ll swim upstream. Even if you don’t think this seems like a horrible idea in every possible way, it’s tough to get too excited: Hallström is like a human shock absorber, and that smoothness is reflected in every emotionally airbrushed moment, whether Blunt is mourning for her new boyfriend (Tom Mison) -- who disappears mysteriously after being deployed to Afghanistan -- or those angry terrorists who seem to have escaped from another movie are trying to pop off our handsome Magic Arab. When the recessive style works with the characters and the kooky international-incident story, Salmon Fishing in the Yemen has an absorbing, old-fashioned sweetness. The crackle of Scott Thomas’s performance -- rarely has someone had more fun saying ahhhh-sss -- cuts the breathless tension developing between Fred and Mary, and the exotic settings are just fabulous enough to sweep you away. But when the blend of classic and hyper-contemporary are not working together they are working against each other, making for some pretty jarring tonal lurches. We see Muslim men praying several times throughout the film, and when the script finally pauses to address it, the general wistful tone feels disingenuous: “I don’t know anyone who goes to church anymore,” Fred says in wonderment. “On Sundays we go to Target.” I imagine in the fullness of the novel a line like that has the resonance of context and perhaps even self-satire. In this often perilously simplistic film it just comes off as dopey. It’s too bad Blunt and McGregor have to compete with the flimsy conceit holding the story together. They make a lovely couple, even buried behind a heightened writerly style and the awkward persistence of those cliff-scrambling extremists. Surely there’s a sympathetic Sheik out there with fifty million to drop on a second go around? That's a really nice update. Have you thought of Salmon fishining in the Comox area of Vancouver Island? Someone necessarily assist to make severely posts I’d state. That is the very first time I frequented your website page and to this point? I amazed with the research you made to create this particular put up extraordinary. Magnificent task! I mistakenly categorized the salmon as a “Cat Photographer” expense when it should have been filed under “Other.” Also, I left a $1 tip at Sizzle Pie, but forgot to include it here because it wasn’t reflected in the receipt. So, adjust the numbers accordingly if you’re so inclined. I hope this personal finance blog post was useful and edifying.